Having a clear, intuitive and modern control system makes it easy to improve operations on your vessel. Alfa Laval offers a smooth and simple way to replace your existing Aalborg Unisab boiler control system with the very highest standard in boiler control – Alfa Laval Touch Control. Alfa Laval takes care of the entire retrofit process, from preinspection and engineering to reclassification and updating your documentation. 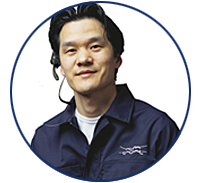 You can rest assured, knowing that our service experts will handle everything from start to finish. To ensure minimal disturbance of your daily operations, we can perform the retrofit either during your voyage or at a convenient time when your vessel is docked. Our high-quality project management matches the equipment supply to your schedule, so that hardly any effort is needed from you. Alfa Laval has the world’s largest global service network for boiler control systems. Our service hubs – which can be reached 24/7, 365 days a year – are located in major ports and can organize Field Service assistance as well. Easy upgrading to the modern standard in boiler control. 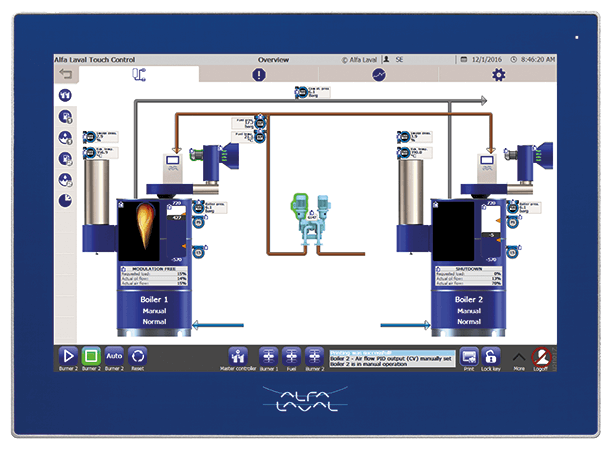 Because Alfa Laval Touch Control comprises prefabricated modules, its installation is fast and problem-free. Either through pre-inspection or with the assistance of the vessel’s crew, our experts assess the current setup (with or without MGO conversions) to eliminate risks and ensure success. Based on the pre-inspection and/or information provided by the vessel’s crew, our experts undertake the necessary engineering work. We also manage the reclassification of your vessel or vessel series with the upgraded control system. Our experts note the existing parameters, remove your Unisab control system and install and connect the Alfa Laval Touch Control hardware. They then perform a range of tests to make sure everything is working properly. We see to it that your documentation is updated – on board and at your technical office, but also in our own central systems. Keeping this information current will simplify any future dispatch of a spare part or service engineer. In addition, we provide Alfa Laval.